November 15, 2018 Supanun Poopat, M.D. Children with a family history of Atopy are at a greater risk of experiencing the condition. Atopic dermatitis is a condition with symptoms that come and go, alternating between periods when it flares up and periods when it lies dormant. The symptoms of this condition usually decrease with age and, in over 80% of infant sufferers, subsides altogether by their teenage years. Treatment for atopic dermatitis comes in many forms. Proactive treatments are currently utilized in order to prevent against or reduce the chances of a rash occurring. Atopic dermatitis is a condition that affects 10-20% of children worldwide. Symptoms include dry, red and itchy rashes that flares up and go for an extended period of time. Infants begin to display symptoms from the age of 2-3 months, while up to 60% of sufferers will experience symptoms during the first year of their lives. What are the main causes of the condition? 1. Genetics: Children with a family history of Atopy are at a greater risk of experiencing the condition than children with no such family history. 2. Structural skin defects: These include, for instance, losing greater-than-normal amounts of water through the skin, a reduction in skin lipids, abnormal skin acidity and alkalinity, an imbalance in the skin’s microorganisms and abnormality of the skin’s immune system. Temperatures that are too low or too high. The presence of irritants, such as chemicals, perfumes, alcohol or friction caused by rough clothing materials. Food allergies, for instance, allergies to milk, eggs and/or nuts can cause rashes to flare up. Such allergies affect around 10% of young infants who have moderate to severe atopic dermatitis. These groups also do not respond to standard treatments. Airborne allergens, for example, dust mite and mold. Symptoms of atopic dermatitis include dry, red and itchy rashes, which come and go for an extended period of time. In some cases, the rashes may have crusted on top rash or the skin may become thickened due to repeated scratching. Infants under the age of 2 years tend to suffer from rashes on their cheeks, foreheads, nape of the neck, the skin on the outer part of the arms and legs, as well the wrists and ankles. Infants over the age of 2 years tend to experience rashes on the neck, and inner parts of both elbows and knee joints. Pediatric doctors will analyze the patient’s symptoms and family history of allergies as the main form of diagnosis. Laboratory testing are usually unnecessary, unless the patient has not responded well to treatment. In these cases, the doctor will consider additional information and form a diagnosis based on potential food allergies or exposure to certain chemicals associated with the rashes flaring up. 1.Basic skin care should regularly be carried out to help reduce rash occurrences. Bathe in water of a normal temperature for no longer than 5-15 minutes, 1-2 times per day. Reduce soap usage as it is not necessary to be used every time we bathe. Apply cream or lotion after each time you bathe while the skin is still moist. (additional cream may be applied throughout the day if the skin dries out or begins to itch). Avoid substances that could potentially irritate the skin, such as sweat, saliva, chemicals, perfumes, alcohol, sand, grass, and clothings that aren’t breathable, are made from rough fabrics, or/and fur. Topical anti-bacterial agents may be used in cases where a skin infection has occurred alongside an inflamed skin rash. Oral anti-bacterial agents can be used to treat skin infections which occur in numerous locations throughout the body, or those which affect an enlarged area of the skin that also has an inflamed skin rash present. Oral antihistamine agents may be used to reduce any potential scratching which could cause an open wound and subsequently increase the risk of a skin infection. Additional care for any rashes which covered with crust by applying a saline-soaked gauze onto the rash for 10-15 minutes before taking it off. This will help to remove any crust from the rashes, meaning that any medicated creams will be more effective. Other forms of treatment. In cases where the aforementioned treatments would not yield effective results, the doctor will instead consider other forms of treatment, for instance, oral anti-inflammatory agents, oral immunosuppressive agents or phototherapy. There is currently method of treatment available to prevent or reduce rashes occurring. This method is referred to as ‘proactive treatment’. It is carried out through the use of anti-inflammatory medication applied to areas of skin most prone to rashes, such as the inner sections of the knees and elbows. These creams are applied 2-3 days per week, during the periods of time when the rashes are dormant. 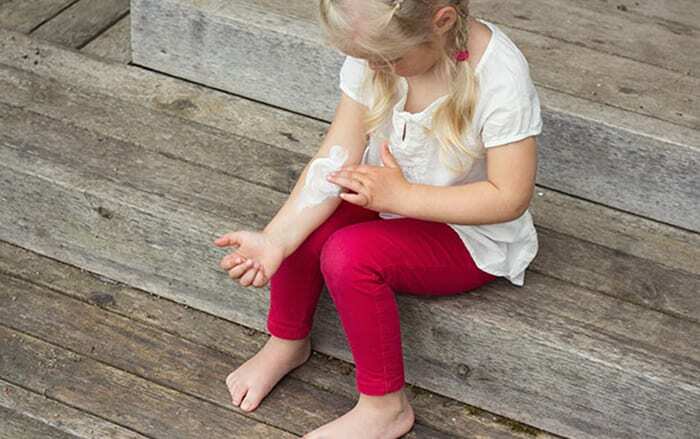 There is currently no treatment available to effectively prevent against atopic dermatitis but it is believed that applying creams and lotions during early infancy will reduce occurrences of atopic dermatitis. Atopic dermatitis is characterized by skin rashes which come and go, alternating between flaring up and lying dormant. Additionally, occurrences of atopic dermatitis tend to go away as patients grow up, with 80% of sufferers leaving their symptoms behind by the time they reach adolescence. Infants who suffer from atopic dermatitis may develop other forms of allergies as they age, for instance, allergic rhinitis and asthma. Atopic Dermatitis Atopic dermatitis is a condition that affects 10-20% of children worldwide. Infants begin to display symptoms from the age of 2-3 months, while up to 60% of sufferers will experience symptoms during the first year of their lives.